Built-in Logic plugs, plus more: ArturiaÃƒÂ¢Ã¢â€šÂ¬™s MiniMoog, RMIV drums, Slayer2 guitars, UltraFocus, Camelspace gating effect, T-racks mastering. Keyboard controllers: Three of them, no less: CME Pro 7 (now distributed by Yamaha), Novation ReMote SL25 (which automaps nicely to Logic), and the Virus TI Polar. The Virus is the only sound source. M-Audio Trigger Finger for drums, samples, muting and unmuting tracks. But where’s Ableton Live in all this? Dolby claims he can’t use Live because his music doesn’t fit into 4-beat bars. That’s actually not the problem he thinks it is; you can easily cue irregular beats in Live by quantizing to the beat instead of the bar, much as he describes doing in Stylus RMX. But this is also a great setup, and benefits heavily from all the built-in instruments and effects (vocoder, anyone) in Logic. Could you do it on a budget? In fact, thanks to Logic, this setup doesn’t have to cost a fortune. Dolby says we might want to tally up the whole cost, and I’ve done that, painstakingly researching the street prices of all this gear to determi. . . uh . . . okay, actually, I don’t want to do that. But let’s think about a bare-bones setup: get a MacBook Pro ($2000), plus Logic ($1000, though less if you’re a student), plus an audio interface (PreSonus makes one for less than $200), plus a mic (Shure SM58 Blue is about $150), plus a Remote SL keyboard (extra octaves for just $600) . . . just over US$4000 for an entire road setup. Not bad, especially given that you probably have a lot of this gear. Throw in some Shure E series in-ear monitors for $150. Still not cheap enough? How about a reasonable PC laptop ($1000), or even a Core Duo Mac mini plus a compact LCD and rack for about the same price, plus an Edirol keyboard ($220, and I’ve got one I love right here), plus Ableton Live ($400), and Reaktor for all the synths and effects you could ever possibly want ($500). Just over $2000. You could even just play with Reaktor for your beats if you wanted. 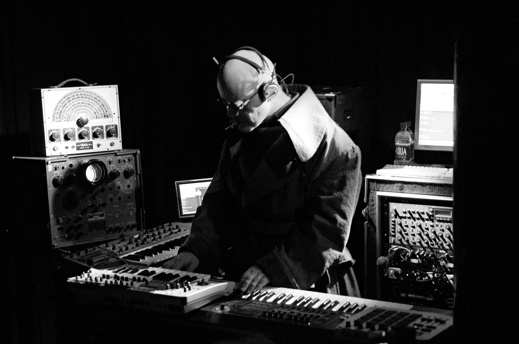 There are various other combinatorics, but most of what Thomas Dolby has is more of everything — three keyboards instead of one, extra plug-ins, an extra rig for plug-ins (the Receptor) even though he’s running backup tracks. And, as Dolby himself notes, this is a far cry from a $120,000 Fairlight CMI in the 80s. Just make sure you spend a little extra effort on the retro-sci fi-cool details like those shades and headphones. And notice the keyboards are up front, computers in the back? It makes a difference. Thanks to the first post on the CDM performing board, via 3l33t_v4cuum, for the lead! Previously: Logic-based road rigs have included rack-rig Mac minis (part I, part II), Vince Jones’ rig, and even young kids using Logic and Novation keyboards. (Watch out, Thomas; that little girl wants your gig.) And more Logic stuff, too.